Sputnik, the first man – made satellite, Laika, the first dog in space, Gagarin, the first man in space…what do they have in common? It all became possible because of the vision, passion and talent of one man, the Soviet engineer Sergei Korolev. In his homeland he is lovingly referred to as the Father of the Cosmonautics. Surprisingly, during his life, Korolev was unknown not only to the general public, but also to many engineers and even cosmonauts. Caught in the Cold War with the US, the Soviet government feared that he might be captured or even killed. That is why his name was kept a secret and he was commonly referred to as the Chief Designer. This month, on January 12, the scientific community will celebrate the inventor’s 111th Birthday. So who was this mysterious man and what was his contribution to the modern space exploration? Sergei Korolev was born in 1907 in Zhytomir, back then the city in Russian Empire, now Ukraine. Sergei attended primary school, where he excelled in maths, then he was homeschooled. He studied aviation first in Kiev and later in Moscow, in the prestigious Bauman Technical University. After graduation, he worked in various labs, designing airplanes and later rockets. Korolev dreamed about space travel. He believed that the technology can be developed to send humans to the faraway destination such as Moon and Mars. He and the small group of forward – thinking scientists devoted all their free time trying to designs a vehicle powerful enough to overcome the Earth’s gravity. By 1933, merely four years after his graduation, Sergei Korolev became the head engineer of the Jet Propulsion Institute in Leningrad (now St. Petersburg). Few years later he was falsely accused in political sabotage and sentences to 10 years of imprisonment. After 6 years in prisons and labour camps he was released in 1944 and and sent to Germany to lead the group working on the new missiles. In the years that followed, Korolev opened the door into space for the future generations. In 1959 he launch the first man-made satellite into the Earth’s orbit. After that success, Korolev became confident that humans can fly into space too. The dogs were his first passengers. Laika, Belka and Strelka as well as many others travelled beyond the Earth and proved that living organism can survive the journey. Yuri Gagarin was the first human passenger of Korolev’s rocket Vostok-1. Vostok 2-6 carried five more soviet cosmonauts into space. Later, Korolev modified his Vostok spacecraft and built the new craft Voskhod. Simultaneously, he worked on the Lunar exploration program. The engineer has designed and launched three spacecrafts. One of them became the first man – made object to reach and crashland on the Moon. The other was the first to photograph the far side of the Moon. 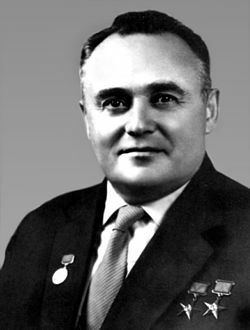 Sergei Korolev worked on the prototype of the Soyuz spaceship. He also had plans to build the space station as well as the rocket for the journey to Mars. Unfortunately the genius scientist didn’t live long enough to make his plans a reality. A crater on the Moon, a crater on Mars as well as an asteroid bear Korolev’s name. Many streets in both Russia and Ukraine are named after the great space engineer too! There is even Korolyov town on the outskirt of Moscow. Many future rocket engineers train there. But the best tribute to Korolev’s genius is the Soyuz rocket, whose first prototype was designed in Korolev’s lab. Every few months the modern Soyuz takes a new team of astronauts to the International Space Station. Visit our mobile planetarium to learn more about the space race, rockets and astronauts. There is a very interesting four episode BBC docudrama about the Space Race and it’s two main figures: Sergei Korolev and Wernher von Braun. Though not perfectly accurate in all the details, the series give a good sketch of the main events between the end of the WWII and Apollo 11 lunar landing. Highly recommend!